Today's prisoner is Ruberlandis Maine Villalon. An activist with the Patriotic Union of Cuba, or UNPACU, Maine has been in jail since Aug. 26, 2013. He is currently serving a 5-year sentence after he was convicted of "assault" and "disrespect," two "crimes" the regime frequently uses to target its political opponents. The human rights commission said Maine is in jail because of the numerous peaceful opposition activities he has participated in. Also important to note that Maine is affiliated with UNPACU, one of the largest and perhaps most active opposition group on the island. 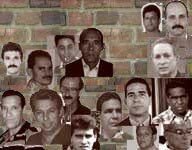 Led by former prisoner of conscience Jose Daniel Ferrer Garcia,m nmerous of its activists are currently in Cuban jails.